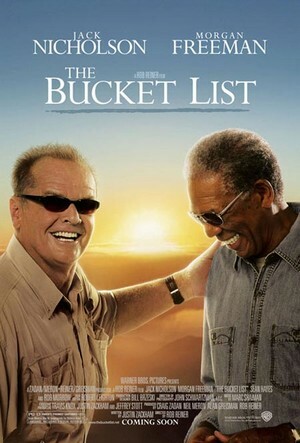 The Bucket List is the odd couple formula with a little incentive: they’re both dying of cancer, and want to make more of their last months on earth. It’s a stoic effort, but a few too many of the plot devices hinge too heavily on a few factors. Super intelligent and world weary Carter Chambers (Morgan Freeman) is a kind hearted mechanic that once had a dream: to be a history professor. After 46 years of marriage and three children, he’s all but put aside his wants and focused entirely on his family. On the other side of the spectrum is billionaire commercial hospital real estate owner Edward Cole (Nicholson) as the vicious businessman who’s put his work first and his family second. Both are diagnosed with terminal cancer, and given only 6 months to a year to live. As fate goes, both are hospitalized in the same room of Cole’s hospital where the rule is ‘two beds to one room’. Upon Carter’s dismal diagnosis, he crumples up a sheet of paper; his ‘bucket list’ he later tells Cole, all the things we wishes to do before he dies. The wildly rich and lovable Cole with all his fortune decides to take his new friend and fulfill his list, by jetting to exotic locales such as Paris, Egypt, and India (who knows if the studio merely put them in front of a blue screen, the salaries alone for this pic sounds pretty hefty). Which goes to show, as bleak as a situation is, it isn’t so bad when you’re stinking rich. Not exactly something shared by all. Could be why I didn’t give this flick a higher rating, it’s not like I could do things I’ve been meaning to do since I was 15, I simply don’t have the funds, and the worrying about paying back the loans would kill me. I love seeing Nicholson do some comedy now and again, call me crazy, but I think he’s pretty good when he’s paired up with a big leaguer like Freeman. Besides, I had to chuckle when they were skydiving and arguing like the old guys they are. Both are funny in their own right. But the chemistry doesn’t seem like it’s melding here, perhaps they’re not liking the idea they’re in a buddy-movie for old men. Either way, the lack of sparks made the film seem flat and tired. 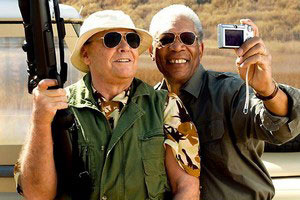 Even the god-like voice over narration of Freeman seemed a bit desperate, as if Rob Reiner tried to tag on a line of ‘c’mon: it’s Morgan Freakin’ Freeman!’ Both play their parts to a ‘T’, Nicholson being the wild eyed prankster, and Freeman being the kindly wise man. 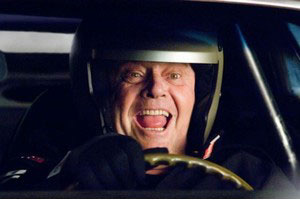 Neither can do much to keep the Bucket List from becoming a sappy re-telling of grumpy old men. The real treat is the ending, not exactly a feel good type but it certainly does tug at your heart strings, and hits all the right notes at the close.